Advances in technology have made it easier to create your own trade show graphics. However, it’s easy to get lost in the technology and lose sight of the basics. When it comes to creating a trade show display, your images and messages should be simple and your layouts clean. Below are five basic elements that every trade show display should include, and tips for using each of these elements to create an effective trade show display. Simple, bold and clear images are the most effective in creating a memorable canvas for your selling story. Ornate, involved, mysterious, and confusing art and graphics may be great to look at but can be distracting and much less effective as a backdrop for your trade show message. If you are in the market for trade show graphics, many services offer simple searches and reasonably priced photos and illustrations to create trade show display graphics. Most people who did not plan to visit you at the show will walk past your booth. They may, at best, give your display a passing glance. This, believe it or not, is often your only chance to grab them. 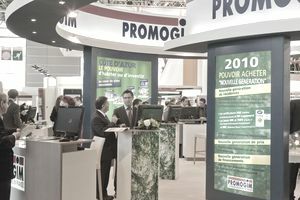 If your trade show display has a carefully thought out and compelling headline, they may choose to take an extra moment and learn a little more about your company. The shorter your headline, the larger it can appear on your trade show display. The larger it is on your trade show display, the further your display can reach into the trade show traffic. Even a small tabletop display with a short bold message can be seen from several yards away. Your choice of typeface is also important. With thousands to choose from, the task of selecting the right one can seem daunting. Tip: Choose a simple and easy to read typeface. Next time you’re at a trade show, take notice of the displays produced by large companies. Not necessarily large booths, but even tabletop displays produced by large and successful companies consistently use simple bold graphics. You can and should do the same. The key to creating an effective trade show display, whether a floor display or a tabletop display, is simple images and messages and a clean layout, as Alex explained earlier in this article. It’s amazing how many trade show displays seem to hide their company name. You pay a lot of money to exhibit. Take a little extra effort and make certain your company’s name is easy for all to see. Tip: Place the company name in the header portion of your trade show display, as most trade show visitors will expect to find it there. As for a company logo, if you don’t have one, we suggest that you create one. It is your opportunity to create an impression. It makes you look established. Business Logos - Get Your Logo Working and Branding Basics - 7 Logo Design Tips provide more details. Probably the single most important message in your whole trade show display is your website address. This is because if the show attendee saw something at your booth that interests them, they can copy your website address, even at a distance, and visit it at their leisure. If you don’t already have a website, get one (see Create a Small Business Website That Works and Marketing Online: Basic Strategies Any Business Can Use). To get started with social media see How to Create a Social Media Plan, How to Create a Fan Page on Facebook and Why Your Business Should Use Twitter. Follow the five basic elements outlined above to make any tabletop display or floor display more effective at your next trade show.